After a robust competition at the Singapore University of Technology and Design for the Island Taekwon-Do Centre 26th Anniversary Championship, we joined members and guests at @ 29 on Carpenter Street for a feast – not just for our stomachs but also for our eyes and ears. Master Daniel Sng opened the dinner with a speech that said “now that the competition is over, it is time to strengthen our bonds by sharing food and enjoying each other’s company.” He also said that “punching, kicking, and throwing each other may seem like a strange way to become better friends to people who have never done martial arts,” but that is indeed what we do, and once we “fight” someone, we just know them better. I totally agree with this as my best friends in Singapore are long-standing members of ITC who have trained and graded with me during my “formative years” as a Taekwon-Do student under Master Daniel Sng’s guidance. We have shed much blood, sweat, and tears together and the bond forged through that does not weaken even though I have since moved back to Japan and seldom get to train at ITC now. I can further attest to this as Mr. Kelvin Goh, III Dan, taught me 6 of the 9 colour belt patterns as I was coming through the ranks, and even though, for various reasons, Mr. Goh has not worn a dobok for a while, I still consider him my mentor and the Goh and Takagishi families have a strong bond that seems to get stronger over the years. 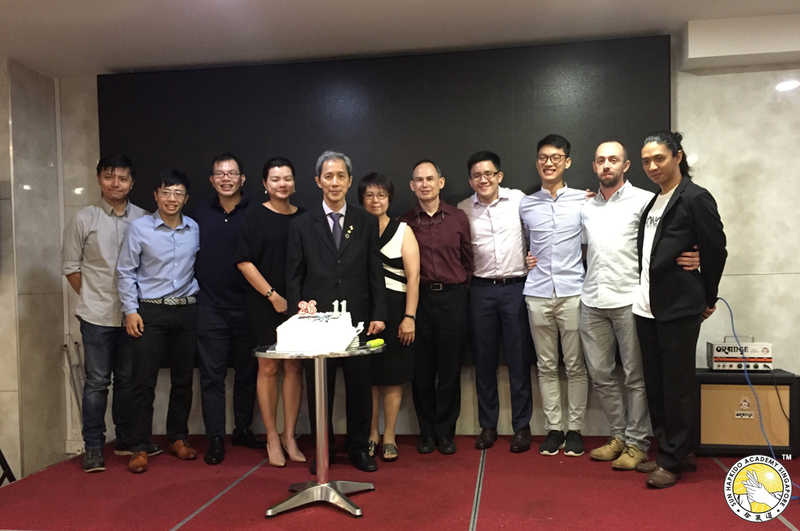 As is the custom at ITC and Sun Hapkido Academy, Master Daniel Sng presented overseas guests with gifts. Supporters were also presented with plaques made of gold, silver, and bronze medals. Because Sabum Jong Sa Park, VI dan, our Chief Instructor, was not able to make this trip, Mr. Yasuo Tsuda, III dan, received the gift for Sabum Park on his behalf, and I received the plaque and delivered it to him. Master Sng and ITC really make overseas guests feel welcome and give us mementos to tell us how much our friendship and support is valued. Even without such material gifts, we would still remain supporters and friends of ITC, but the gesture is appreciated. The entire ITF Hyogo JAPAN delegation was honored to be sitting at the table with Master Daniel Sng, Master Spiridon Cariotis from Australia, Mr. Laurence Wee and his lovely daughter, Miss Nicole Wee, and Mr. Ken-ichi Nonaka of ITF Matsumoto. We also got to see old friends at the other tables, and had time to exchange greetings and gifts of our own. The evening’s entertainment kicked off with a dance performance whereby the dancers’ mask kept changing with the flick of the head! That certainly had both the young and young at heart glued to the stage! After the initial performance, a dancer went to various tables and used the table cloth to make his moustache appear and disappear. This was certainly something we had never seen before and we were fascinated! Madam Karen Yong kicked off the karaoke singing with Master Sng’s favourite song. She was joined on the stage by Master Sng, who was very touched by her performance and as usual, was not shy to show his affection for her. My children were very moved by the affectionate interaction between the Master and his wife. They get to see the strict, confident, and authoritative side of Master Sng in the dojang and the competition. But seeing his softer, more affectionate side made them admire this dedicated martial artist even more. “Mama, Master Sng is so nice! Now I won’t be afraid even when he sounds fierce,” my daughter said. Mr. Yasuo Tsuda got up in an attempt to find a Japanese song to sing, but was unsuccessful in finding his song among the karaoke catalogue. So, to take his place, I decided to sing the one English song I can sort of pull off at Karaoke – the Beatles’ “Help!” In all my years of training at, and visiting ITC, I had never sung before. So I am sure it came as a surprise to everyone. I had to say to Sir at the end of the song, “Sir, the things your antique furniture does for you!” and he gave me a big smile of approval. Perhaps in the future, singing could be included in the grading process at ITC to dig up more talent. There was more singing followed by Mr. Stephen Slater’s guitar solo. In fact, no Anniversary Dinner is complete without the treat of hearing Mr. Slater play. Then, came the lucky draws. And we had a lucky winner of our own, Oozora Teodore Takagishi! He won what he thinks is the best prize of the night – a North Face duffle bag that holds all his training gear, including his head gear! “I am so glad I did not win the fryer or the vacuum cleaner!” he giggled. There was plenty of excitement with other prizes for everyone else, too. So much so that the lucky draw was done in two parts. There was an air freshener, vacuum cleaner, and various vouchers for shopping and hotel stays. The varied and generous prizes are always an obvious sign of the calibre of supporters and contributors ITC and Sun Hapkido Academy have. And I am sure the lucky draw is one of the highlights of the evening for many. I must also mention that no one is forgotten at the event, either. This year, we all received luggage tags as door gifts. My children and I put them on our bags as soon as we got back to the hotel! The gift instills in us a strong sense of belonging and pride as we show the whole world who we are associated with. Even the most enjoyable events must come to an end – and so the dinner was over and we all shook hands and said good-bye. But the overseas guests were treated to an after-party at Clarke Quay! As Mr. Tsuda only got one hour of sleep on the flight to Singapore the previous evening, he was struggling to keep his eyes open after one mug of beer. And with the time difference, so were our young friends from Australia, too. The only thing that kept some of the youngsters awake was Turkish ice cream from a vendor next to our table! As the saying goes, “all work and no play makes Jack a dull boy” so we got our fun to fuel the hard work we must now resume in our training! Last but not the least, I would like to congratulate Mr. Stephen Slater, Chairman of the Organizing Committee of the Anniversary Dinner, and his Committee for putting together an amazing entertainment program and a fabulous event! May Island Taekwon-Do Centre and Sun Hapkido Academy live long and prosper!